Siobhan Creanor, Associate Professor in Clinical Trials and Medical Statistics at Plymouth University Peninsula Schools of Medicine and Dentistry (PUPSMD) and Director of the Peninsula Clinical Trials Unit (PenCTU), has been highly commended in the Science Council’s Continuing Professional Development (CPD) Awards 2016. Five awards were made this year and two were to scientists from Plymouth University – Siobhan and Jemma Walker, a PhD student and dental researcher. 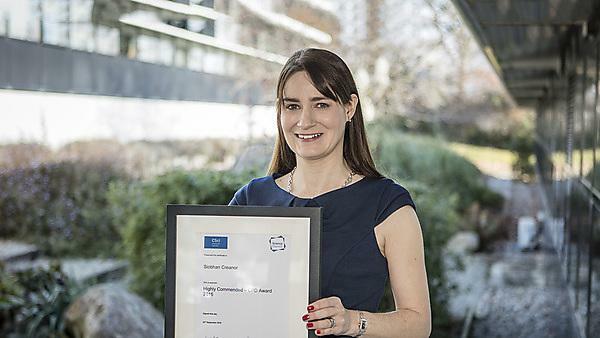 Siobhan received the commendation for her achievements in CPD in the Chartered Scientist category. She has been a Chartered Scientist since 2009, as well as holding Chartered Statistician status, awarded by the Royal Statistical Society, since 2004. PenCTU, of which Siobhan is Director, came into being from a local clinical trials group which started life from a single large randomised trial investigating the role of cannabinoids in multiple sclerosis in 2000. It became known as the Peninsula Clinical Trials Unit when its UK Clinical Research Collaboration (UKCRC) registration was confirmed almost 10 years ago. Siobhan also leads the medical statistics group at PU PSMD, which undertakes research, commercial projects, consultancy and teaching, within PU PSMD and beyond. An example is the Down’s syndrome screening Quality Assurance Support Service (DQASS) which has been run within the group since its inception in 2006 and the internationally-renowned EarlyBird study. The group also takes pride in encouraging and nurturing talented and enthusiastic junior statisticians, providing them with opportunities to develop their careers, take part in impactful projects and enabling them to apply for chartered status in the future.